What’s So Great About Single-Hand Spey? Question: Every time I pick up a fly-fishing magazine or go into a fly shop, it seems that more space is devoted to Spey rods. Since I fish for trout exclusively, I haven’t paid much attention to the rise of two-handers, but now I’m starting to hear more guys talking about “single-hand Spey” stuff. Why would I want to Spey cast with my trout rod? This piqued my interest and made me think that perhaps Spey fishing wasn’tall that different. A couple years later, I met world-class caster Way Yin at the Sandy River Spey Clave in Oregon, and he explained how he uses Spey casting techniques with a single-hand rod all the time. He showed me a few tricks, and I headed home intent on trying out these moves to see if they worked with my styles of fishing. The answer is a definite yes. I have found that Spey-fishing techniques come in handy in many trout-fishing situations. In early spring, when the Battenkill (my local river) is high, there are lots of places where you can’t wade out very far, but you need to make a 30-foot cast to get your streamer to the fish-holding structure. The tree-lined banks offer no backcast room, and a roll-cast is very difficult when you’re using a sinking tip and a heavily weighted fly. I have found that a single-Spey cast gets the heavy fly to the surface, repositions the line, and keeps everything in motion so that when you make the presentation cast at the end, it’s much more powerful than a roll cast. I’m still far from an expert, but when you do everything correctly, it’s astonishing how well you can cast the heavy line and fly this way. I was amazed to find that the technique is useful even on the tiniest brookie streams, too. The river that flows past my house is completely overgrown in summer, so it becomes like a green, leafy tunnel. The only way to fish it is to stand in the water and cast directly upstream. The problem is that, as your fly drifts back to you, you need to pick up the slack, which requires you to then make several false casts to get the line back out. 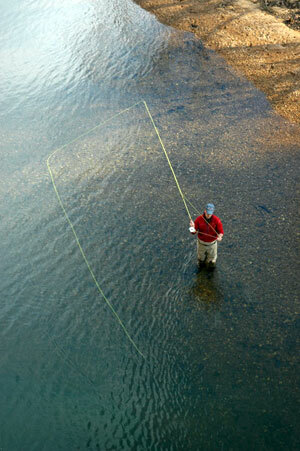 The more you false-cast in such tight conditions, the more likely you are to snag a tree or a bush. However, if you use a modified Spey cast, you never have to false cast. Here’s how it works. As the fly drifts back toward you, instead of picking up the slack, you move your rod tip across your body and downstream on your offhand side. When it’s time to cast again, you use a sweeping single-Spey motion—back across your body—to get the line in front of you, finishing with the presentation roll-cast cast directly upstream. It’s incredibly easy to do with a floating line and a dry fly. There are lots of other casting techniques normally associated with two-handed rods—the snap-T, snake roll, etc.—that work great with your trout rod. Even if you don’t see yourself chucking chucking a Skykomish Sunrise across a wide British Columbia river, it pays to learn the ins and outs of two-handed casting. I’m sure you’ll find lots of occasions when a no-backcast, change-of-direction cast will make things easier for you and help you catch more trout.